While the enamel of the teeth is the hardest substance in the human body, its strength has its limits. Chipped teeth are a common occurrence at any dentist office. 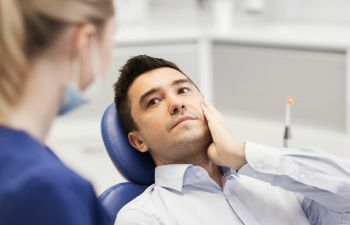 Whether it is from crunching on ice or hard candy or from an injury or fall, repairing a chipped tooth is a frequent procedure done by dentists all over the United States. At Gold Hill Dentistry, we offer patients cosmetic dental procedures to correct the damage of a chipped tooth. We are a comprehensive dental practice in Fort Mill, SC that utilizes state of the art cosmetic dental care in a relaxing, caring environment. For those who have chipped a tooth (or teeth) it is important to see the dentist as soon as possible. While a chipped tooth may seem like a minor dental issue, in fact, the entire tooth could be further damaged or suffer infection causing the complete loss of the tooth. Acetaminophen can be taken according to packing directions to relieve any pain associated with a chipped tooth until an appointment can be made with the dentist. Chipped tooth repair treatment will depend on how severely the tooth has been damaged. If only a small piece of enamel has been broken off, the repair process is generally quick. However, if the tooth has been badly damaged, a chipped tooth repair may require more extensive dental work. At Gold Hill Dentistry, we work with all of our patients to care for them in an individualized setting. We understand that a person’s smile is incredibly personal to him or her, and we strive to do our best in restoring a chipped tooth to the highest standard. If you are in the Fort Mill area and have a chipped tooth or you are looking for a dental practice to trust with the health of your teeth, contact Gold Hill Dentistry today.